This holiday season, instead of escaping the snow, embrace it! There is nothing like being outside in the winter, enjoying a fresh layer of powder while you ski downhill, or along the trails through a quiet, peaceful forest. A ski escape during the holidays is a fun way to be active, spend quality time with your family or friends, and create memories that will last a lifetime. While winter usually settles in well before the third week of November, moving further north can increase your chances of having fresh snow. A top pick for November skiing is the posh resort town of Banff, Alberta. Located inside Banff National Park, Banff is located about 90 minutes west of Calgary. Average temperatures in Banff in November range from 18-32 °F, with an average snowfall of just over 13 inches. 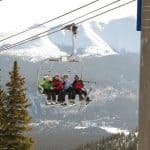 As if you needed something else to be thankful for, the three major ski resorts – Lake Louise Ski Area, Sunshine Village, and Mount Norquay – offer a tri-area lift ticket that allows you unlimited access to ski and snowboard. The town of Banff is full of great restaurants to choose from for your Thanksgiving feast. Try the Maple Leaf Grille & Lounge for a traditional sit-down dinner, or go low-key and fun with a burger at Eddie Burger + Bar. 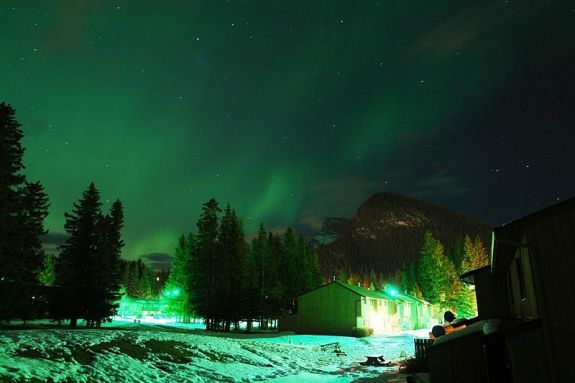 The aurora borealis over Banff, Alberta. Northern ski destinations up your chances of seeing the Northern Lights. A trip to Tahoe at Christmas provides many fun options. Just on the border of California and Nevada, Tahoe is a hop, skip and a jump to Reno, or you can schedule a stop in Las Vegas or Sacramento on your way to your ski destination. Once you arrive in Lake Tahoe, be prepared for excellent ski conditions and a variety of non-ski activities to choose from. To guarantee the best skiing, Heavenly supplements its average 360 inches of annual snowfall with one of the largest snow making systems in the country. Heavenly consistently receives high marks from travelers for their kid-friendly activities and high-quality customer service. When planning a trip over the Christmas holidays, it’s the extra-special touches that make the difference. Apres-ski nightlife includes shows, dining and dancing, casinos, and more. Instead of exchanging gifts for Christmas, have every family member pick an activity to do together: a trip to the hot springs, a scenic helicopter tour, or a day of shopping. 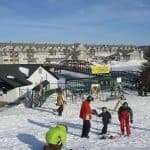 By mid-winter ski resorts are at their peak season, particularly on and around holidays. Whistler, BC enjoys a temperate climate, and is designed to handle large crowds comfortably. 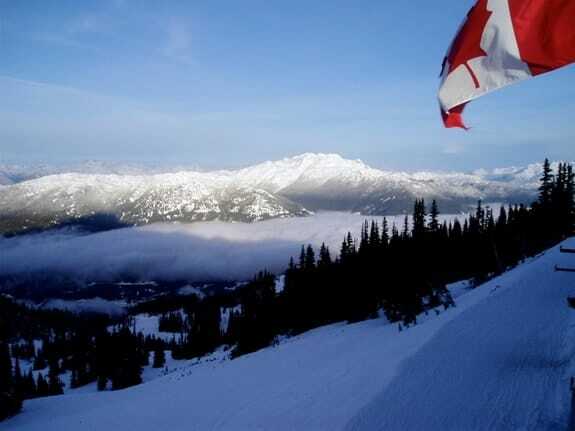 Mild weather and reliable snow conditions make Whistler, BC a consistent favorite among skiers and snowboarders. 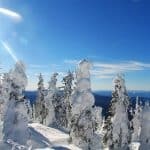 Its proximity to the coast keeps the alpine temperatures in a comfortable 11-23 °F range from December to February, and the average yearly snowfall is around 33 feet. 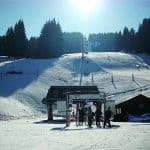 If you are worried about huge holiday crowds, Whistler can handle the volume with its PEAK 2 PEAK gondola, which connects Whistler and Blackcomb Mountains at their summits. Blackcomb has an hourly capacity of 29, 112 while Whistler can service up to 34, 345 skiers per hour. 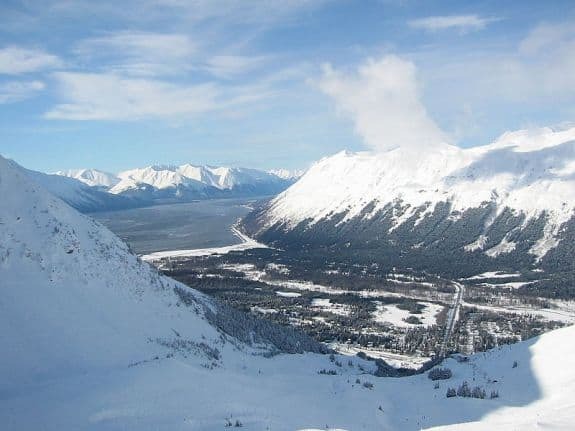 A view of Girdwood, Alaska from Mount Alyeska. Skiers know that come spring, the snow can be hit or miss. Alyeska Resort is located in the quirky little resort town of Girdwood, Alaska. You will enjoy top-quality skiing and get a taste of small-town Alaska. Anchorage is just an hour down the Seward Highway if you want “big city” action. For late-season skiing, head north to Alaska! An Easter or Spring break trip to the world-class Alyeska Resort in Girdwood, Alaska is a perfect spring skiing destination. Located just 40 miles down the road from Anchorage, Alyeska remains open through late April and, weather permitting, there are May weekend operations as well as spring camps. Nestled in the majestic Chugach Mountains, Alyeska enjoys over 650 inches of snow fall annually. By April you will enjoy enough sunlight to ski for hours, but night skies are still dark enough to give you the opportunity to see the Northern Lights. If you thought the colors in your Easter basket were beautiful, you haven’t seen anything yet.